Home for the Holidays, new for 2018 our First Homecoming tins are filled with all your favorite snacks. The 6½, 3½ and 2 gallon tins are filled with All Buttery Flavored Popcorn or a 3/way combination of Caramel, Cheddar Cheese and Buttery Flavored Popcorn. 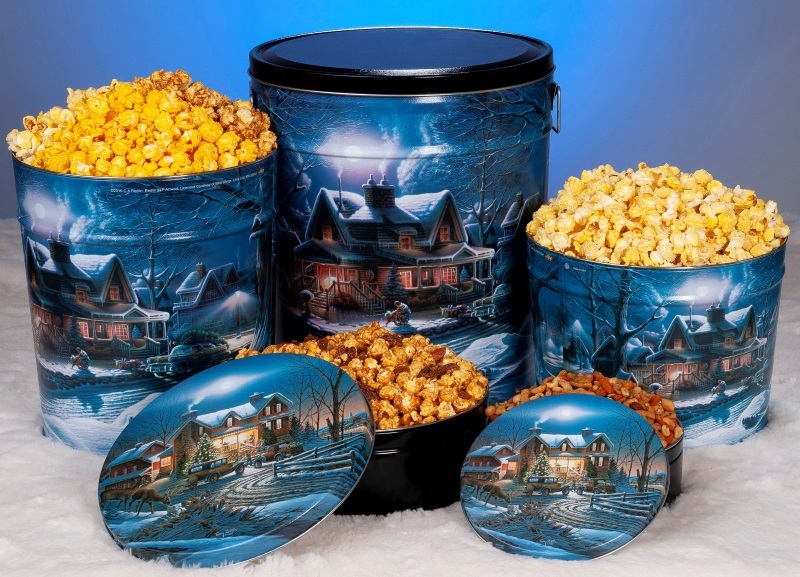 The 3½ gallon tin also available filled with our favorite flavors - Vanilla Flavored Popcorn with Almonds and Pecans, Caramel Popcorn and Cheddar Cheese Popcorn. The 1 gallon tins are filled with our specialty popcorn flavors - Caramel Popcorn drizzled with White and Dark Chocolate or Vanilla Popcorn with Almonds and Pecans.